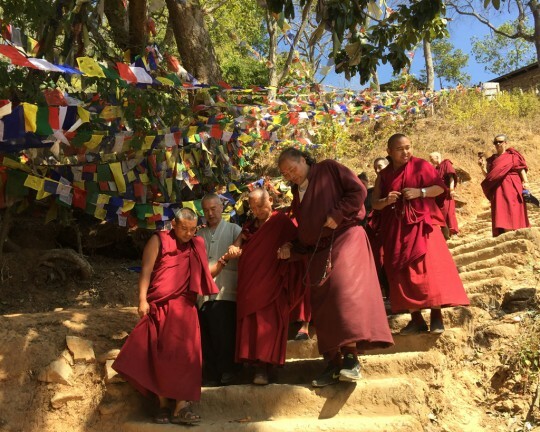 Lama Zopa Rinpoche at Maratika Caves, Nepal, February 2016. Photo by Ven. Roger Kunsang. A student close to passing away wrote Lama Zopa Rinpoche saying she didn’t get to finish her preliminary practices and was not clear what to think and practice. Please read Practicing the Five Powers Near the Time of Death. Not only read, but really try to understand it. Regarding your question: it’s OK that you haven’t finished the practices. Focus now on practicing rejoicing, doing a mala of rejoicing in yourself, your own merit, and also a mala rejoicing in others, in all sentient beings’ merit. When you rejoice in all your merit, this means all your past, present and future merit. Then, the second one is all sentient beings’ past, present and future merit. The third is numberless buddhas’ and bodhisattvas’ merit – all their past, present and future merit. Rejoice! Do one mala of rejoicing for each or even three malas. Do not only do them in the morning, but, if you can, also do them in the afternoon and evening time. You can do it like that three times a day or at least two times a day or at least once a day. Don’t worry about not completing the other practices, but try to keep any commitments you have taken from initiations. The other most essential practice at this time is reciting the names of the 35 Buddhas and Vajrasattva practice. Pay more attention now to purifying negative karma collected from beginningless rebirths from having broken pratimoksha, bodhisattva and tantric vows (if you have taken them). It is so important to purify and the 35 Buddhas are very powerful. You can have your hands just in the mudra of prostration and then, if you have received the initiation, visualize your body as Thousand-Arm Chenrezig. Your body as the deity then fills the whole earth. Numberless Chenrezigs doing prostrations to the merit field. However many there are in the merit field, this is all one’s root guru. With that awareness, recite the names. It’s very, very important, as well as with Vajrasattva practice, to do the four opponent powers; it becomes very powerful purification. Without doing with the four opponent powers, then the practice is not so powerful. In regard to rejoicing: without merit, there is no success, no happiness. There’s no enlightenment – the ultimate happiness – liberation from samsara, but also there’s not even temporary happiness in this life and the next life. Therefore, merit is sooooo precious, unbelievably precious. Think: “I have collected merit from beginningless rebirths up to now.” Rejoice how wonderful it is! How wonderful it is! Rejoicing means your mind feels happy. You have to know that this human rebirth comes about just one time and this opportunity to rejoice comes almost just one time. Rejoice in the collected merit. It is also extremely rare, so rejoice in all the collected merit from beginningless rebirths up to now so that your mind feels happy. How wonderful it is! How wonderful! The first time, when you rejoice in all the merit collected from beginningless rebirths up to now, it doubles. When you rejoice the second time, the merit is multiplied by four. The third time, it is multiplied by eight. All the merit collected from beginningless rebirths up to now – wow, wow, wow! So amazing! When you do one mala, can you imagine? When you do two malas or three malas? Wow, wow, wow, amazing, amazing, amazing! Many people may not know how rejoicing is so important. Even most Buddhist people may not know. Even those who practice Mahayana teachings may not know how important it is. When you rejoice in your own merit, it is like this. So in daily life, we should rejoice. One is able to collect more merit. During the second time, when you rejoice is other sentient beings’ merit, by rejoicing in the merit of those whose level of mind is lower than you, you collect double the merit. If your level of mind is the same as theirs, then you collect the same amount of merit. If their level of mind is higher than yours, then however much merit is collected by them, you get half. For example, I used to explain to people that there is the Maitreya Project that would be 50 stories high if it were built. And there would be not just that large statue, but there would be many statues inside and so many statues outside. If somebody comes along and rejoices in the merit and if that person’s level of mind is higher than ours, then that person collects double the merit. So however much merit we collect, that person collects double the merit. If that person has the same level of mind and then she rejoices, she gets the same merit as we get having built the main statue and all the other statues. If her level of mind is lower than ours, then that person collects half the merit that we collect having built the statue. For example, if one who doesn’t have bodhichitta rejoices in one bodhisattva, one gets half of the merit that bodhisattva collects in one day in that one second of rejoicing. Without rejoicing, if you are going to try and collect that much merit, it takes 13,000 years. This is according to Dechen Pabongka Rinpoche in the Liberation in the Palm of Your Hand. So, by rejoicing for one second – even if you don’t have bodhichitta – you collect so much merit. It’s unbelievable, unbelievable, unbelievable! There are numberless sentient beings whose level of mind is lower than yours, numberless sentient beings whose level of mind is the same as yours, and numberless sentient beings whose level of mind is higher than yours. Wow, wow, wow, wow, wow, wow, wow! When you rejoice, so much merit is collected so quickly and that means more purification; it means quicker freedom from the oceans of samsaric sufferings – not only from cancer – but from the oceans of samsaric sufferings and delusion and karma, and quicker achievement of peerless happiness, the total cessation of all the obscurations and completion of all the realizations: full enlightenment. It is so important to know how to practice Dharma. I am only talking about rejoicing, explaining how to practice – it is so, so important. For example, there could be one person who lives 100 years – even a Buddhist who relied on Buddha, Dharma, Sangha and practiced the Mahayana teachings – but who doesn’t know about the important practice of rejoicing. However, even if you only live one day but know how to practice rejoicing – wow, wow, wow! The merit collected in that day is so precious. It’s unbelievable, unbelievable, most unbelievable – like skies filled with a billion dollars, filled with wish-granting jewels. It’s more than that. Skies filled with gold, filled with wish-granting jewels is nothing compared to the merit created. It is unbelievable, unbelievable, unbelievable – can you imagine? Merely owning gold, wish-granting jewels, and zillions of dollars cannot help you to be free from the oceans of samsaric sufferings. Please think about this and read this over and over so that you are really familiar with it. Scribed by Ven. Holly Ansett, Tso Pema, India, January 2016. Edited for inclusion on FPMT.org.